The Audi A8 is available in both short-wheel base and long-wheelbase (A8 L) configurations. The A8 3.0T has a super-charged 3.0-litre V6 engine and the A8 4.0T has a twin-turbo-charged 4.0-litre V8. The long-wheelbase models are also available with a 3.0-litre turbo-diesel V6 and a 6.3-litre W12. The performance-oriented Audi S8 also has a twin-turbo 4.0-litre V8. All models come standard with an eight-speed automatic transmission and all-wheel drive. The A8 hasn't been fully re-designed since the 2011 model year. 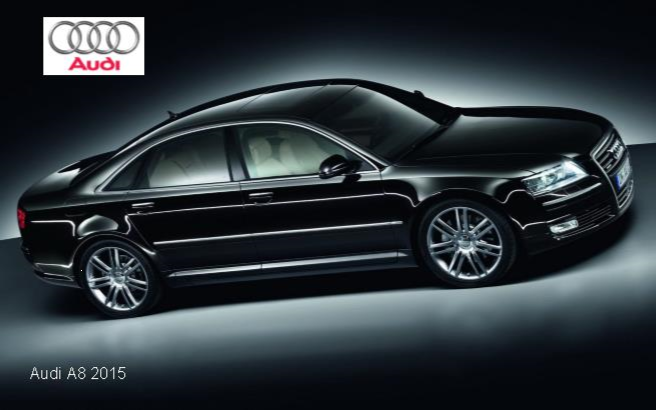 · Automotive writers are impressed with the Audi A8's offers nimble handling, a strong engine and a lavish interior. · Every A8 comes with an eight-speed automatic transmission and all-wheel drive. · According to the EPA, the 2015 A8 3.0T gets 12.4/8.1 kms/100 kms city/highway, which is good for the class. · Test drivers agree that the A8 has excellent handling with the agility of a much smaller sport sedan. · They impressed with its sharp steering, excellent traction and smooth ride. · Test drivers are impressed with the Audi A8's interior opulence, high-end materials and great styling. · Critics say the front seats are comfortable with roomy rear seats but are disappointed with the boot space offered by a car of this size. Leather upholstery, power-adjustable front seats, heated front seats, a 14-speaker Bose surround-sound audio system, satellite radio, a USB port, Bluetooth, front and rear parking sensors, a rearview camera and Audi's MMI infotainment and navigation system. · Heated front and rear seats that are ventilated with massaging feature. · Panoramic sunroof, 19-speaker Bang & Olufsen sound system, blind spot monitoring, active lane keep assist, adaptive cruise control, forward collision warning, a head-up display, night vision and a surround-view camera system. Reviewers are impressed with the number of high-tech features in the A8.